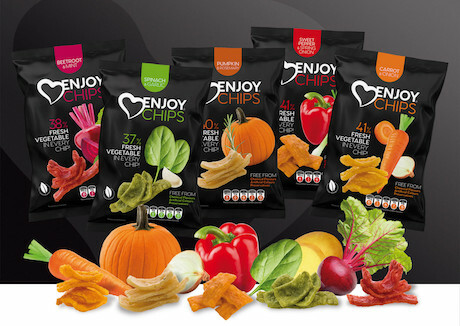 "Enjoy Chips is a combination of know-how and creativity that has been creating a revolutionary snack range since 1987. We have been accurately mapping food habits for the past thirty years, which has led us to creating niche snacks. 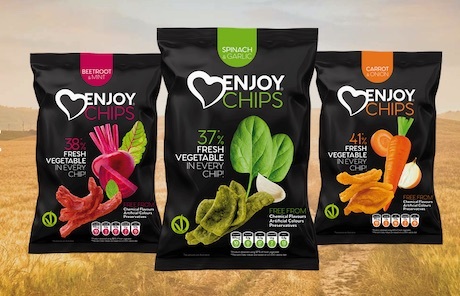 Our mission is to make sure people can enjoy chips in a healthier way, without renouncing the pleasure of enjoying a product that can be nice and healthy at the same time," explains Veronika Khustochkina, customer service manager for the brand. 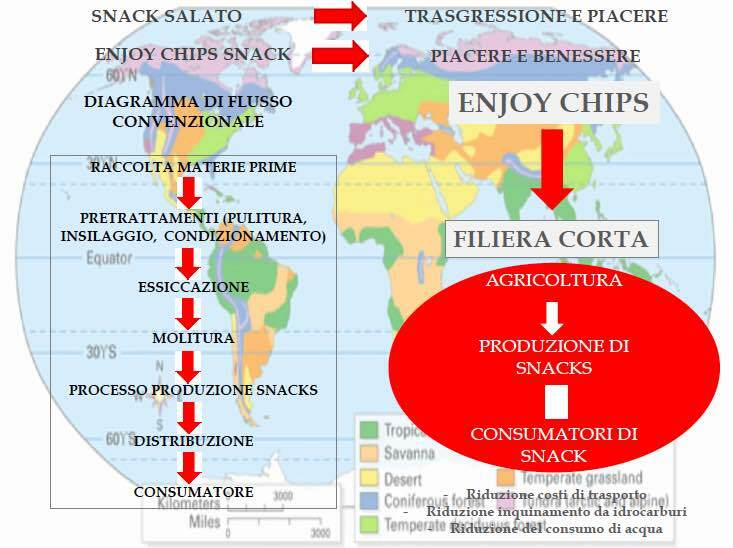 Enjoychips Srlis located in Galliera Veneta (PD) and is managed by agricultural entrepreneurs from Puglia (http://www.poacoop.it/azienda/) and by a financial company located in the Czech Republic (https://khypo.cz/). The group collects raw material from 1500 hectares: 700 of asparagus (main product with a yield of 12 ton/ha), 300 of tomatoes and other types of vegetables including broccoli, artichokes, Swiss chard and fennel. The operating grounds are located on four facilities covering 7000 sq m and equipped with 7 storage units and 3 controlled-temperature sections. 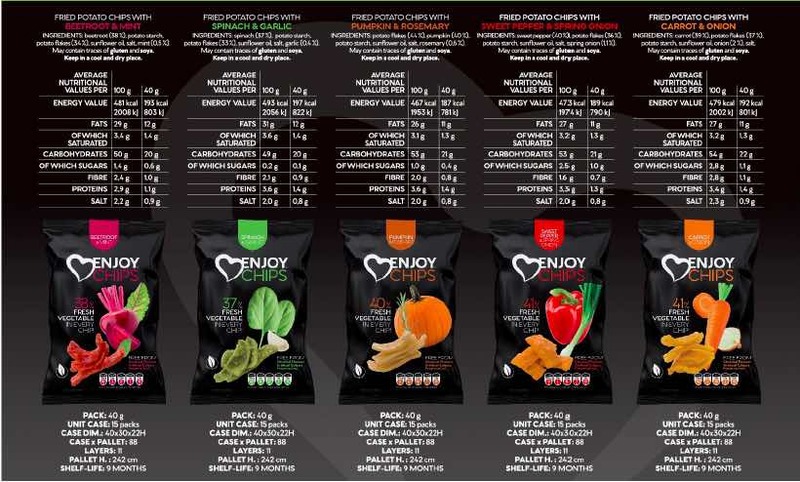 With Enjoy Chips, the objective is to supply a functional snack using only whole vegetables produced with a natural process with no refining. "Our production can adapt to almost all requests. At TuttoFood in Milan, we will launch a revolutionary product part of the snack segment. The novelty consists in managing to integrate over 40% of fresh vegetables into classic chips, making them healthier. Our chain is short and fully-monitored, as we produce almost all the vegetables we use." No industrial flours or aromas or other chemical components are used during processing. After an accurate study, 20 gr mixes with less than 100 calories were developed, obtaining an ideal snack for the psycho-physical well-being. The result is a savory snack rich in fibers and colored naturally with only 6% of fats, cooked in the oven and therefore with acrylamide levels below the recommended limit and with a low salt content. The product is innovative, as any vegetable can be turned into a snack, creating an infinite range of combinations. Fresh vegetables are inserted into the production process whole together with natural spices that exalt their flavor. The flavors available in 40 and 22 gr packets are: Carrot and Onion, Pumpkin and Rosemary, Spinach and Garlic, Pepper and Spring Onions, Beetroots and Mint. The brand holds the Vegan Ok and HCCP certifications and the ISO certification is under approval. The products are distributed in all continents through business units. The reference channels are the retail chain, food producers and distributors and chains focusing on healthy food. "We want to develop personalized solutions and, most of all, respect the preferences and traditions of the various countries. At the moment, we are the pioneers of unique products, as our competitors use vegetable flours or sliced vegetables. What makes the difference is that we integrate classic chips with fresh vegetables."